In order to get this up as soon as I can, I will forgo any history. 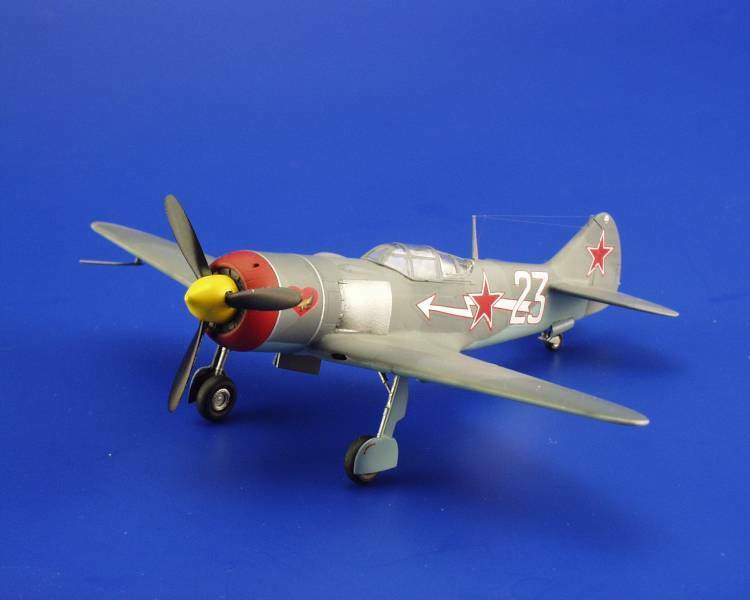 Your best sources for La-7 references are Erik's book Soviet Air Force Fighter Colours 1941-1945 and the MBI book. 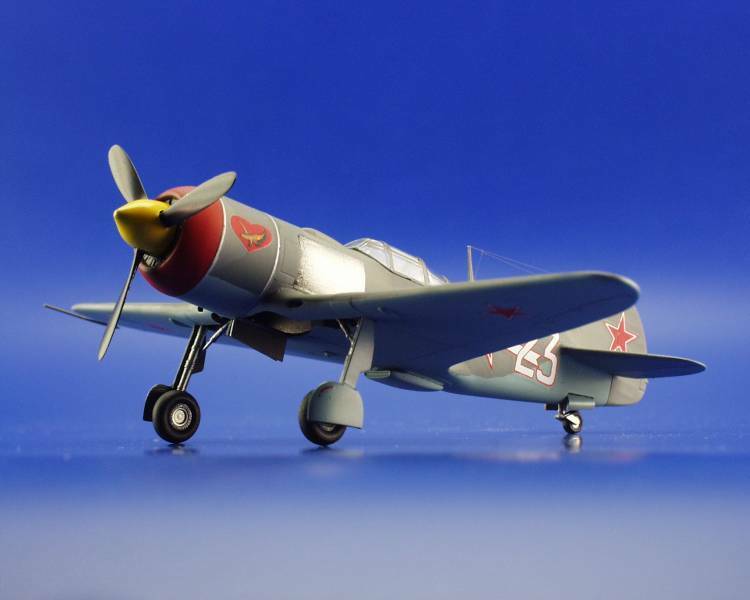 The Eduard 1/72nd La-7 consists of 56 medium-grey injected pieces with 6 clear injected pieces for the canopy and gun sight. 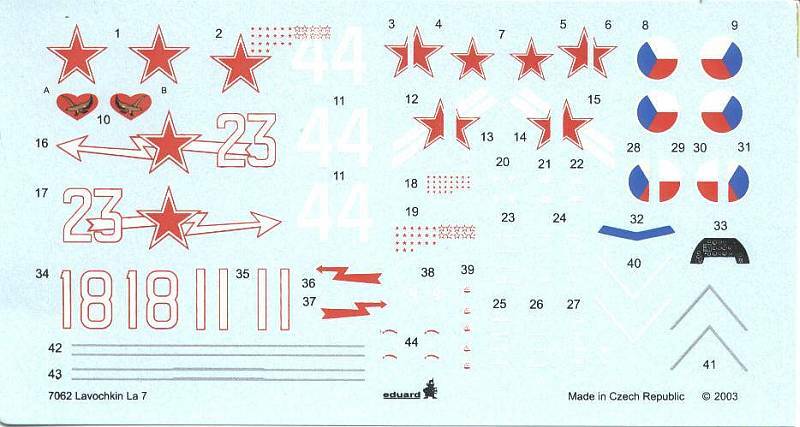 The kit also comes with a set of Eduard's "Express Mask" for masking such things as the clear pieces as well as a mask for the red chevron for one of the markings option. 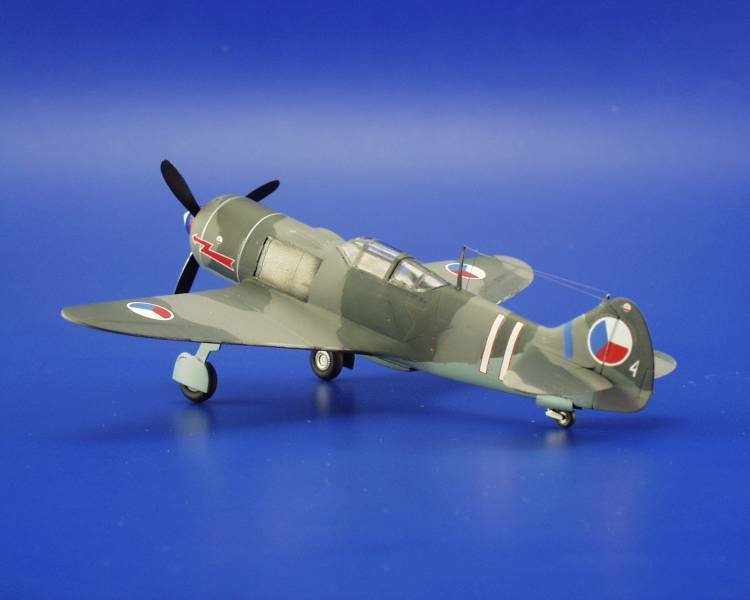 Decals are crisp and in register, and consist of markings for Capt. P. Ya. Golovachev of the 9th GIAP, 303 IAD; Maj. V. I. Koroljov of the 482 IAP; shturman A.S. Kumanichkin of the 176th GIAP; and Flt. Sgt. Stefan Ocvirk of the 2nd Fighter Air Regiment, Czech air force, 1945. 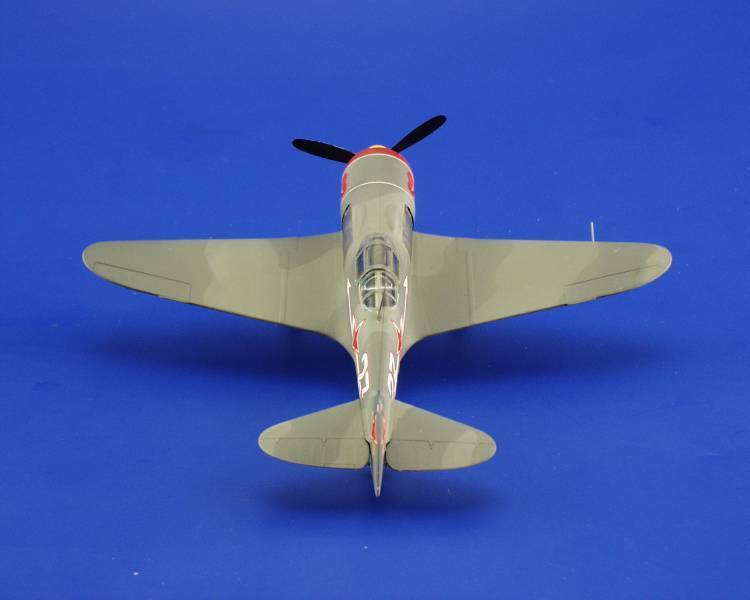 Decals are not only for the main markings but also consists of the typical stenciling as well as the natural metal "band" surrounding the cowl in two places. All schemes are for AMT-11 and AMT-12 over AMT-7. The molding is top-notch and Eduard is to be congratulated on it. It's the best exterior molding I have yet seen in a kit and very too scale. All panel lines are engraved and look very realistic. I can't find any fault in this area of the kit. Note that the parts already exist on the sprue for the three-gun version, although there are no decals to support it with this release. I have heard the profi-pack version - which is to be released in March - will contain not only markings to support the three-gun version, but also photoetch details. Construction naturally starts in the cockpit area. Eduard has molded the cockpit floor in conjunction with the wing, so some of the cockpit pieces are glued to the wing, prior to gluing the wing to the fuselage halves. 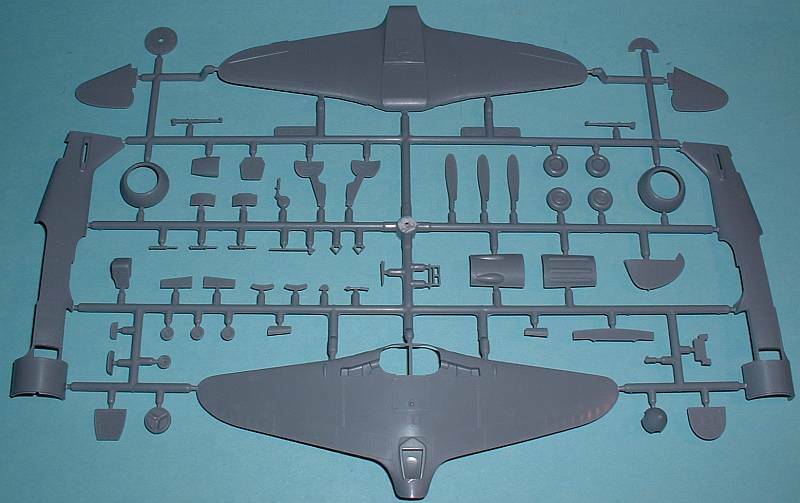 In fact, the first step of the instructions is adding a few pieces to the fuselage halves then gluing them together. Unfortunately the molded-in cockpit sidewall detail isn't as pronounced as their SPAD XIII, but with the proper washes and drybrushes - and if you glue the canopy closed - it should be "good enough". After gluing the seat pieces and instrument panel pieces (along with the instrument panel decal) together these are inserted into the closed fuselage halves. Once that is accomplished then the rest of kit construction continues, including gluing on the wing, horizontal tail pieces and rudder, as well as the upper nose piece and forward-most cowl piece. Eduard doesn't provide an engine, but that's not a big deal because even if the shutter vanes were left open, seeing anything through them would be quite difficult. For those that want a more detailed engine and such, maybe someone will release a resin engine and engine-area for you. Personally, I'm not going to worry about it. The propellor consisists of separate blads and spinner, but it's all in injected plastic so there is nothing to worry about with dissimilar materials (personally I don't like the resin-spinner with injected blades, or vice-versa, since that requires using either CA or epoxy). Once all the major pieces are glued together, then it's on to the underside. I plan on only adding the cooler inlet to the fuselage prior to painting, and then adding the rest of the landing gear and gear doors after painting is finished. 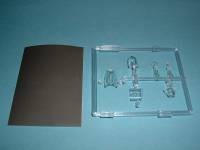 I can honestly say this is the best, 1/72nd WW2/GPW kit on the market today - much better than anything else out by any other manufacturer. It's extremely well designed and not a difficult kit at all. I preliminarily taped the wings and the fuselage halves together, and then mated the two assemblies together. The gaps are minimal and the only one that appears will need any filling will be the front underside joint, right in front of the landing gear wells, where the wing meets the fuselage. 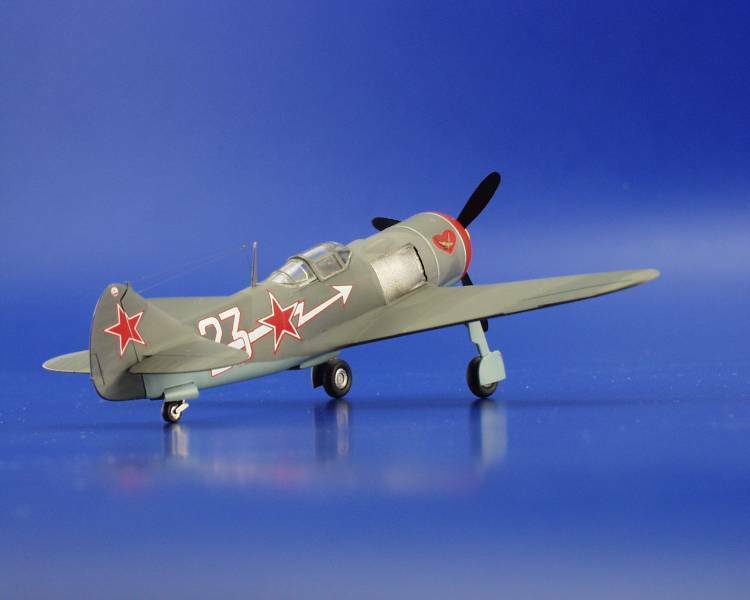 It seems to be said for every model that's recently coming out, but if you like WW2/GPW aicraft in any fashion what-so-ever, you are doing yourself a disservice by not picking up this kit. Not only because it's the best out there - hands down - but also because we need to show the model companies (Eduard especially) that there is a market for VVS models. It would be huge shame if the La-7 is the only VVS aircraft Eduard ever did. 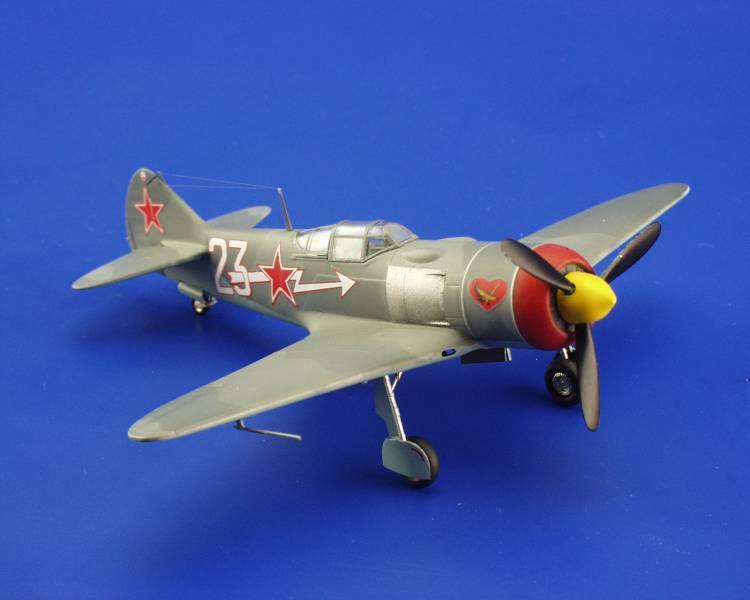 May I be so bold as to suggest Eduard come out with a 1/72nd Pe-2? Can one imagine? Nirvana! 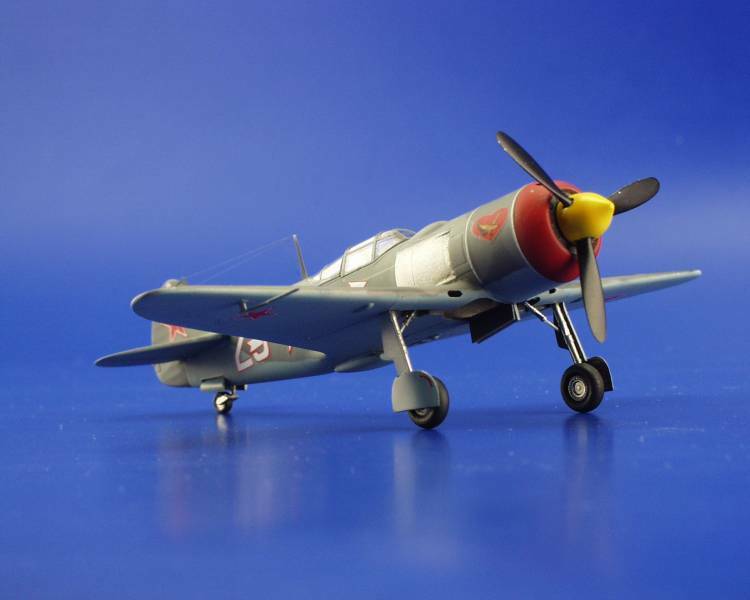 Our thanks to Eduard for supplying the review model. 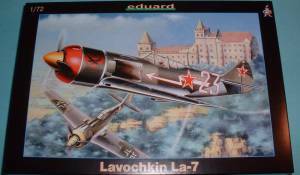 Thanks to Vladimir Sulc of Eduard for the use of his built-up images of their La-7.